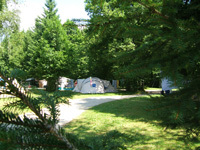 The campsite has two toilet blocks, comfortable with hot water, renovated in 2011 and 2012. The nights are from 13h00 to 11h00. Whether you choose a rigid or folding caravan or lowered, like many vacationers, you chose to take the joys of camping with the comfort of the caravan and ease of travel to visit the wonders of our regions. Our campsite caravan pitches are very comfortable, easy to access. You can easily install your awning, your little nap area and the tent of children. All these criteria are fullfilled at the Camping de la Foret. You've chosen a holiday in a nomadic spirit by crossing France. We welcome you on flat pitches, accessible, comfortable and shady on the campsite with maximum on-site services (except drain gray water). What you'll like: greenery, on-site amenities and proximity, the ability to share your findings with other campers.